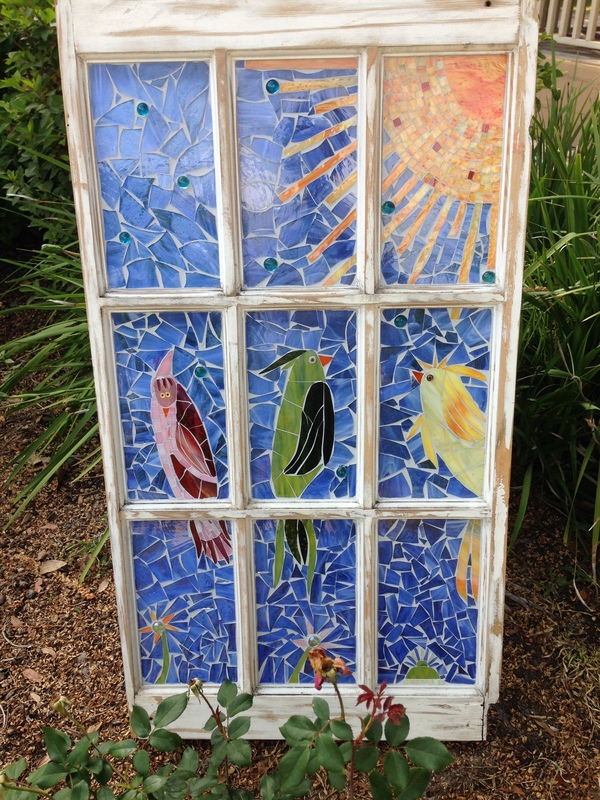 For the past few months I have become very interested in creating glass on glass mosaics. It is quite different from the tiles and stones I have currently used. I love the light shining ‘through’ the different colored glass pieces, as opposed to the light shining ‘on’ the tiles. I’ve found that I really love working on old framed out windows. I found one such window in my stash pile of ‘unique’s that I can’t seem to part with stuff’. That was my first ever, glass on glass piece. You can see by the picture why I named it ‘Birds Eye View’. It was at this time that I used a tile/glass grinder for the very first time. My world has just gotten larger! Then as my divine instincts would lead and have it, I came upon a ‘Mother Load’ of old framed windows thanks to my nephew and his amazing wife. They redid all the windows at their lovely beach home and I was able to pick through their great old stash of windows! You know that was a great day for me! Also,I have just finished a ‘Turtle/house number’ glass framed piece, for my sister and her husband. This was very tedious work and I gotta say, my fingers bled a lot working with the glass! But I was pleased with the finished product. Check out the picture of that one too. Ok, well after my little vacation away with the grands and kids, it’s back to the studio for more wonder work with mosaic.